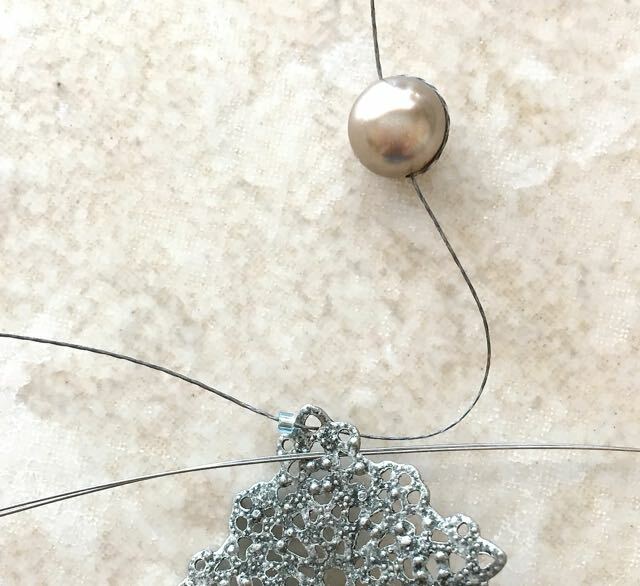 The metal components you see in this necklace were found at Michaels store. 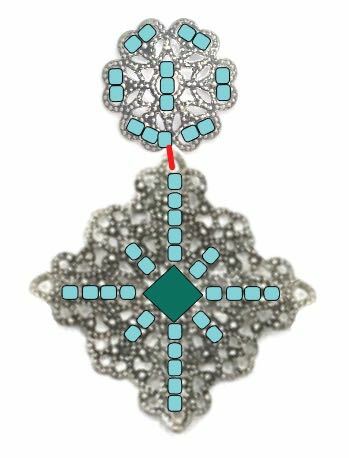 They are detailed in a way that reminds me a bit of Marcasite jewelry. I didn’t know what I might do with all these parts but since they were marked down, I had to take them home. 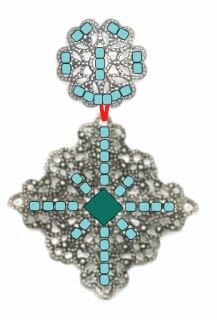 As I thought about what I might create, it occurred to me that one of the visual differences between these metal parts and actual Marcasite, is their absence of shine. That’s when I knew crystal lined seed beads were the perfect addition for this project. Antique-ish and vintage might be the right descriptions for this necklace. And let’s not forget elegant. 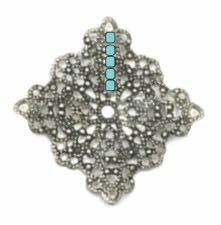 The components have an abundance of tiny holes making it the perfect canvas for attaching seed beads and a feature bicone crystal. If you’ve ever hand stitched anything with a needle and thread, you’ll find this an easy project to complete. step 1 - Cut a one yard length of bedding thread and insert it into a beading needle. step 2 - Add a stop bead about 10 inches from the end of the thread. step 3 - Pass the needle through the top hole of the component. Add a seed bead to the thread. Bring the needle through a hole below the first insertion point from front to back. step 4 - Bring the needle to the front, out a hole below the prior one. step 5 - Add a seed bead. Go back through the first bead. step 6 -From the back, move the needle out the next hole down. Add another seed bead to the thread. Insert the needle into the second seed bead and out the back. step 7 - Continue adding beads and going back through the previous bead until you have a vertical row of five seed beads attached to the metal. step 8 - Insert the needle through a bicone bead. Treat it as the other beads by passing the needle into the bead above it and coming out the next hole below. Add five more beads below the bicone. step 9 - On the backside, move the needle through the existing threads until you get to the center of the component. step 10 - Bring the needle out a hole near the left side of the bicone bead to create the left horizontal line of beads. Add a seed bead then continue adding three more beads the same as you did the vertical line of beads. step 11 - On the backside, move the needle through the existing threads until you reach the center of the component. Move the needle out the hole to the right of the bicone bead. Add four seed beads as you did on the left. step 12 - Continue the beading by returning the needle to the center on the backside of the metal and adding two diagonal seed beads between each horizontal and vertical sets of beads. step 13 - Create three more diagonal bead lines, returning the needle to the center back side of the work before changing direction. step 14 - Finish the focal component by moving the needle through the existing stitching on the back and creating half hitch knots. Cut off excess. Remove the stop bead and slip the thread end into the needle and create half hitch knots to secure the thread. Trim the excess. step 15 - Beading The Round Component Use the same technique as for the focal piece, moving the needle around the outside of the metal but adding two beads at a time. step 16 - Move the needle to the center and out the hole. Add three beads and work the needle back through the nearest vertical hole. step 17 - Bring the needle down to the center and add one bead left of center. step 18 - Insert the needle into the center hole of the focal piece. step 19 - Add one bead and go through the right side hole adjacent to the last insertion point. Work the needle through the four center beads and the focal component for reinforcement. step 20 - Finish with half hitch knots on the backside. step 21 - Use the jump rings that came with the components to link the four remaining metal pieces and chain. Add a lobster clasp and jump ring to the chain ends. The center metal components measure 5.50” wide. 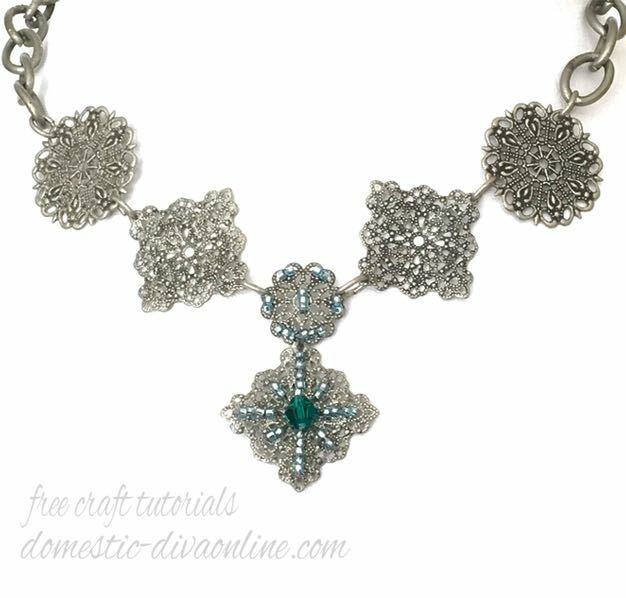 For a 16” necklace you will need approximately 10.50” of chain.